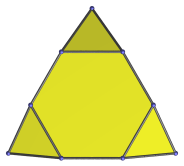 The triaugmented hexagonal prism (J57) is the 57th Johnson solid. It has 9 vertices, 21 edges, and 14 triangular faces. It can be constructed augmenting a hexagonal prism with 3 square pyramids. If an augment is removed, the metabiaugmented hexagonal prism (J56) is obtained. If two augments are removed, the augmented hexagonal prism (J54) is produced. Last updated 04 Sep 2018.